Its major export partners are China, India, and Spain. Its main exports are crude oil and petroleum products. Its major import partners are China, Nigeria, and France. Its major imports include machinery, electrical equipment, and transport equipment. Located in Cameroon, Cameroon has a 5,018.00 km border with Central African Republic (901 km), Chad (1,116 km), Republic of the Congo (494 km), Equatorial Guinea (183 km), Gabon (349 km) and Nigeria (1,975 km). It has a 402.00 km coastline. Cameroon has been involved in territory disputes with Nigeria and Equatorial Guinea. The capital city of Cameroon is Yaoundé, which is located in the south central region of the country along a plateau area that is surrounded by forests. It has an elevation of approximately 2,382 feet above sea level. Additionally, this city is located between 2 rivers: the Sanaga and the Nyong. Yaoundé was first established in 1888 and became the capital of French Cameroun in 1922. Today, it has a population size of just over 2.44 million, making it the second most populated city in Cameroon. The residents here rely on the agricultural industry for employment and even practice something known as urban agriculture, which means they raise livestock or grow produce within city limits. Yaoundé is not a very popular tourist destination and the infrastructure in this city reflects that lack of interest. It is, however, home to several museums and a small zoo that visitors find interesting. This is situated within a tropical wet and dry climate zone and receives heavy rains 10 months out of the year. Cameroon is an African country covering 475,440.00 km2 of which 0.57% is water and 472,710.00 km2 is land. This makes it the 53rd largest country in the world and slightly larger than California. Its geographic coordinates are 6 00 N, 12 00 E and Yaounde is the capital city. The name "Cameroon" comes from the "Rio dos Camaroes", which means "River of Prawns" in Portuguese. Its ISO code is CM. 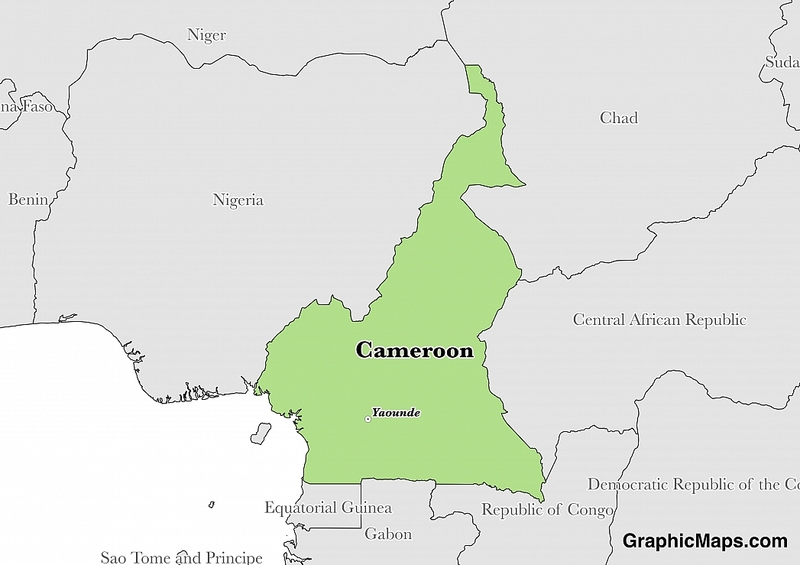 Cameroon has a mean elevation of 667 m above sea level. Its climate varies by terrain, from tropical by the coast to semiarid in the north. Its terrain is incredibly diverse, with plains in the southwest, a plateau in the center, mountains in the west, and plains in the north. Cameroon has a population of 24,360,803 making it the 53rd largest in the world. English and French are official languages; 24 African language groups represented. The majority ethnic group is Cameroon Highlanders, followed by Equatorial Bantu and Kirdi. The population is mostly Roman Catholic, Protestant, or Muslim. The official languages of Cameroon are French and English, which both belong to the Indo-European language family. These European languages are the influence of this country’s history of colonialism. French is spoken by around 83% of the population of Cameroon, while English is spoken by only around 16%. Additionally, English is primarily heard in the Northwest and Southwest provinces, where speakers have created a language known as Cameroonian Pidgin English. Additionally, around 230 indigenous languages can also be heard throughout this country. Of these 230 languages, 173 belong to the Niger-Congo language family, 55 are considered Afro-Asiatic languages, and only 2 belong to the Nilo-Saharan language family. Some of these indigenous languages include: Baka, Akoose, Kotoko, Fungom, Yamba, Gavar, Dek, and Abo. Travelers planning a trip to Cameroon should study some basic French phrases, since this language is spoken by the majority of the country. If traveling to the Northwest and Southwest provinces, some Cameroonian Pidgin English phrases may be useful. Many of the words used in this language sound similar to or exactly the same as English, but are used in a different way. For example, the word “sweet” may be used to refer to something that is considered “nice”. The dialing code for the country is 237. Cameroon is an independent country. It gained independence in 1960. Its constitution was last ratified in 1996. The government of Cameroon is considered a unitary republic, which means the central governmental body holds the majority of decision making powers. The President of Cameroon is at the center of this governmental power and acts as the Head of State and the Head of Government. Legislative actions are carried out by the Parliament, which is made up of the National Assembly (180 seats) and the Senate (100 seats). Even the judicial branch works under the executive branch and is administered by the Ministry of Justice. Prior to April of 2008, the presidency was limited to two 7-year terms, however, Parliament moved to eliminate that restriction. The current President of Cameroon has held office since November of 1982. Representatives of the National Assembly are elected to serve a 5-year term. Both parliamentary houses meet in the same building, which is known as the Ngoa Ekelle Glass Palace and is located in Yaoundé, the capital. Although the government of Cameroon is considered a multi-party system, most of the power is held by only one political party, the Cameroon People’s Democratic Movement. Individuals belonging to independent parties are not permitted to run for parliamentary seats. Factoring in Purchasing Power Parity, Cameroon's GDP is $77,240,000,000.00 (USD) with $3,300.00 (USD) per capita. This makes it the 94th largest economy and its citizens the 180th richest in the world. The currency of Cameroon is the Franc (XAF). Its major export partners are China, India, and Spain. Its main exports are crude oil and petroleum products. Its major import partners are China, Nigeria, and France. Its major imports include machinery, electrical equipment, and transport equipment. 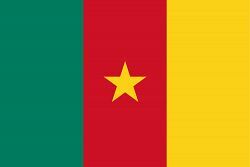 The current flag of Cameroon was officially adopted on May 20, 1975. It is made up of 3 equally-measured, vertical stripes with different colors: green, red, and yellow. A yellow, 5-pointed star sits at the center of the flag. Each of the three colors on this flag has a specific meaning and are often associated with the Pan-African movement, which seeks to increase the bond among people of African descent. The current design of the flag of Cameroon is believed to be based on the French Tricolor, which is in reference to the era prior to independence when this country was administered as a French trust territory. Throughout the years, Cameroon has had several flag variations.